I am extremely happy to be showing you this cake. This cake is the product of my 5-year-old daughter’s imagination. A few months ago, she was playing with some trivets/hot-plate type things from the kitchen cabinets; she was stacking them in such a way that they looked like a quadruple-layer cake! She called it a “madderneine” cake. I asked her what was in the cake and she told me some of the key parts of it. For the next couple of months we occasionally talked about it and finally agreed upon the final verison of her “madderneine” cake. As I show you these pictures, I have to apologize if they are not up-to-par. Our main computer broke and I am using a laptop so I feel I cannot judge the coloring and brightness as well as I should be able to because the screen is so different! I hope they look alright! Anyway, our final version of the “madderneine” cake is this 2-layer white cake filled with pink strawberry-flavored whipped cream and fresh strawberry pieces. 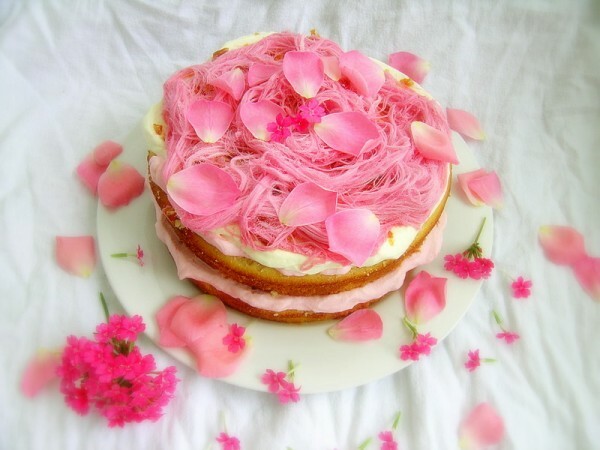 On top is plain whipped cream sprinkled with macadamia praline and the whole cake is fancied up with rose-flavored pashmak (Persian fairy floss). The pink rose petals are from our garden and the little bright pink flowers are from someone else’s garden. We didn’t eat the flowers, by the way, they were just for decoration! It looked very pretty, and my daughter’s eyes lit up when she saw it. She loved it! She ate every last bit of her slice. I did not care much for the cake when it was fresh. It tasted like it was missing something; it didn’t have any depth. The taste was very light. The strawberry flavor is not dominant because the rose pashmak takes center stage on the taste buds. The crunch of the macadamia praline was a nice touch. 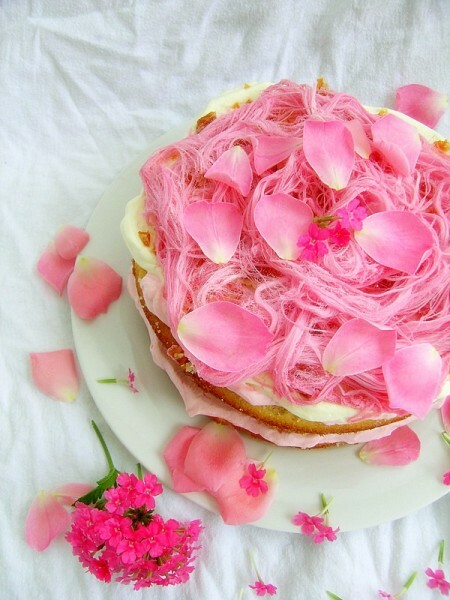 Just a tip – if you’re using pashmak on your cake, only put it on immediately before serving, otherwise, it just melts. It still tastes fine, it just doesn’t look as pretty! Despite how girly this cake is, my husband loved it. He had a slice straight from the refrigerator. When I tried a cold slice for myself, I enjoyed it heaps more than when it was fresh. So, upon this discovery, I would recommend that if you to were make our cake for yourself, try it after it has been thoroughly chilled in the refrigerator. I’m really proud of us, especially my daughter, for helping to bring her make-believe cake to life. 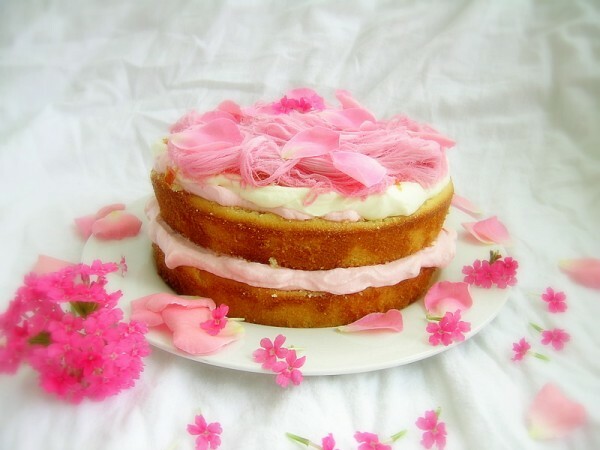 A two-layer white cake filled with pink strawberry cream and frosted with whipped cream. Topped off with crunchy macadamia praline and pink rose pashmak. For the cake: Preheat the oven to 350°F. Prepare 2 8-inch round pans by greasing the pans then lining with baking paper. Mix all of the dry ingredients in a stand mixer on slow speed to blend. Add the soft butter and mix until the mixture becomes crumbly. Increase the speed of the mixer and continue to mix until the crumbs begin to cling together. The mixture may or may not become totally cohesive and paste-like; it’s okay if it does, and equally okay if it doesn’t. In a small bowl, whisk the yogurt (or milk) with the vanilla and almond extracts. Add this mixture, ⅓ at a time, to the batter. Beat 1 to 2 minutes after each addition, until fluffy. Be sure to scrape down the sides and bottom of the bowl. Pour the batter into the prepared pans. Bake for 25 to 35 minutes. A toothpick or cake tester inserted into the center will come out clean when done. Remove from the oven, remove from the pan, cool completely, then assemble. For the whipped cream: Whisk cream to firm peaks. Divide the whipped cream in half; reserve one half. In the other half, add 3-4 tablespoons (depending on your tastes and how strong your flavoring is) of the strawberry milk flavoring, a couple drops of pink food coloring and the diced strawberries and fold gently to combine. For the praline: Scatter the macadamia nuts on a lined tray. Heat the caster sugar and water in a pan over low heat, stirring, until the sugar dissolves. Increase the heat to medium and cook, without stirring, for 10 minutes, brushing down the sides of the pan with a pastry brush dipped in water to prevent crystals from forming. When the caramel is golden, quickly pour it over the nuts. Allow to cool completely, then chop into pieces to sprinkle on top of the plain whipped cream. 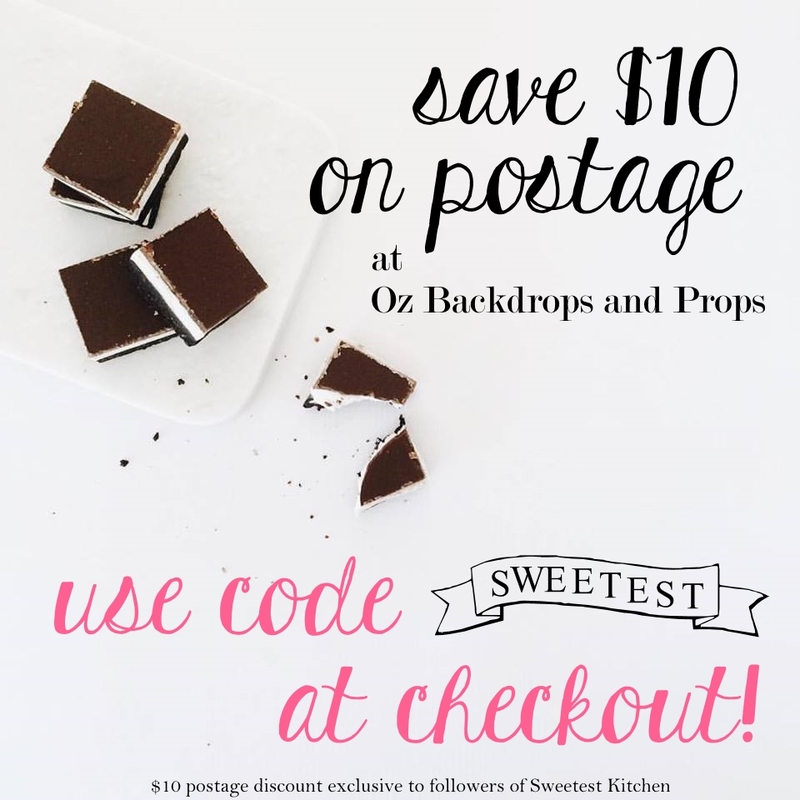 You’ll have plenty leftover to munch on! Rose Pashmak, or Persian fairy floss, can be purchased from pariya.com, or on eBay (which is where I got mine!). 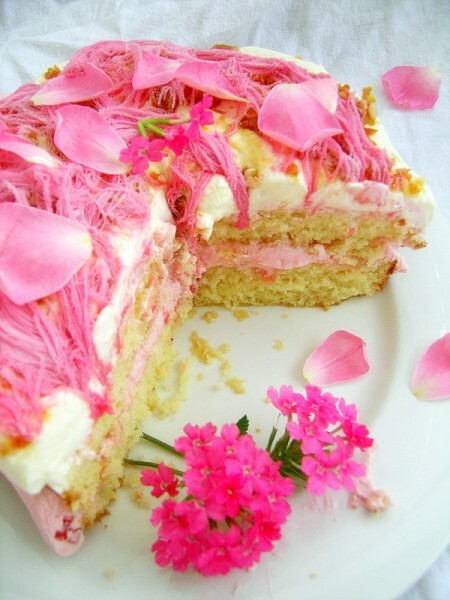 If you can’t find rose pashmak, perhaps you could try flavoring the plain whipped cream with rosewater instead. What a lovely idea to make your daughters imaginary cake into reality. I often take my daughters drawings and turn them into cookies and they are always delightful. This cake looks like a little girl’s cake fantasy comes to life. Just perfect, lovely pinkness! Beautiful photos btw. I just can’t wait until Emma’s old enough for Junior Masterchef. She has a wonderfully creative imagination! Yum! Oh my, that looks just lovely. That cake might just be the most beautiful thing I’ve ever seen. It took my breath away! This is wonderful! I love that it started through your daughter’s play and imagination and the two of you brought it to life together. And that it was delicious too!